This Valentine's Day give your special someone that special something they've always wanted but may have been too modest to ask you for - their very own pour of Foothills Sexual Chocolate and a bottle to take home. 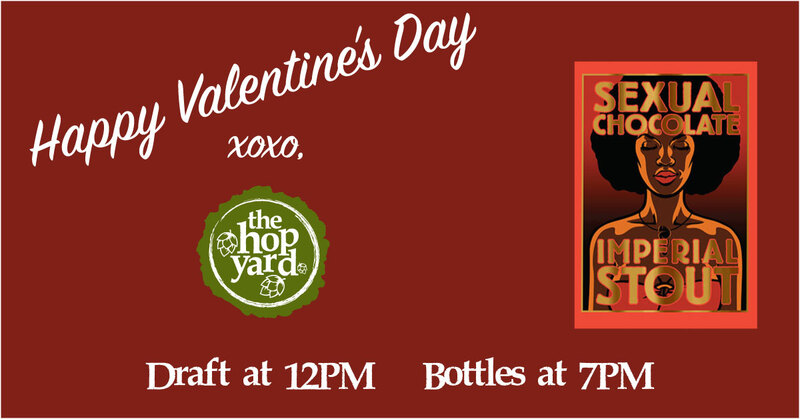 At 12PM when the doors open, we'll have Foothills Sexual Chocolate on draft. Then at 7PM, we'll release our supply of bottles. As with many limited releases at The Hop Yard we do anticipate a raffle for the right to purchase a bottle. No purchase necessary to enter the drawing, only one ticket/bottle per customer of legal drinking age max, no holdsies, etc. You know the drill. Haven't heard of Sexual Chocolate before? It's a 9.6% ABV beauty of a beer that Foothills describes as "A cocoa infused Imperial Stout. Opaque black in color with a dark brown head. Big chocolate aroma with notes of espresso, blackstrap molasses, dark sweet toffee and dark fruit." Cupid ain't got nothing on us!